Mark Kininmonth worked on the trail in its initial construction and can’t wait to introduce you to this magnificent walk. The trail is well signposted, so perfect for a self-guided ‘inn to inn’ walk. Walk 91 will transfer your heavy bags, so you just carry a small backpack. Walk at the pace you choose, with whom you choose on the date you choose. Select a date to get away from it all and Walk 91 will organise your perfect adventure. Walk 91 cannot wait to welcome you to their wonderful backyard, at the start of this unforgettable walk. After a private walk briefing, with maps, lighthouse tickets and walk notes tucked safely away, Walk 91’s friendly local drivers will ensure you are safely whisked away on your magical journey. You choose how far and how fast you wish to walk and Walk 91 will support you all the way. Walk 91 are always close by to offer advice and encouragement and provide an ‘Emergency Position Indicating Radio Beacon’ for walkers. Choose to borrow a Telstra mobile phone (if you are an overseas visitor) and walking poles for those who like to travel light. If you are on an extended trip Walk 91 will happily store any extra luggage you may have whilst walking. At the end of each day Walk 91 offer comfortable accommodation to rest and lay your head, after enjoying an evening of wonderful local food and warm company. The perfect way to enjoy your walk. There is nothing like getting away from it all. 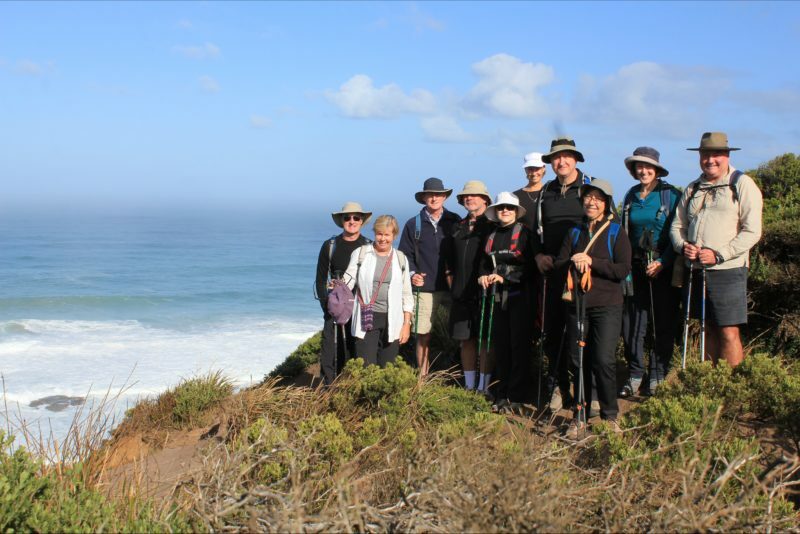 Camping on the Great Ocean Walk is the perfect way to enjoy the trail’s natural beauty. Because all hikers walk east to west, the walk never feels crowded and you can sometimes walk the whole day feeling like you are the only person on the track. 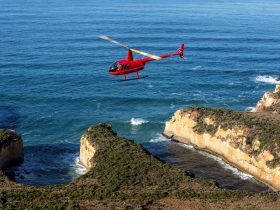 The Great Ocean Walk hike-in-campsites are secluded and small, often tucked away amongst the coastal heath and gum trees. With a table to eat, a shelter and toilet facilities carved out of local timber, you have all you need for a unique camping experience. Don’t want to carry all your heavy gear? No problem. Walk 91 will meet you at the start of your walk and collect all your gear in their trailer. They move the trailer ahead of you on the walk leaving it at the accessible campsites. You just need to plan what yummy food will be waiting for you at your campsite and Walk 91 will supply fresh drinking water (the water is not drinkable on the track). If you are traveling light to this wonderful part of Australia, Walk 91 can hire you all the camping gear you will need. 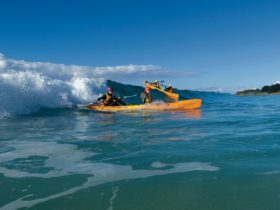 Base yourself in Apollo Bay whilst exploring the Great Ocean Walk. 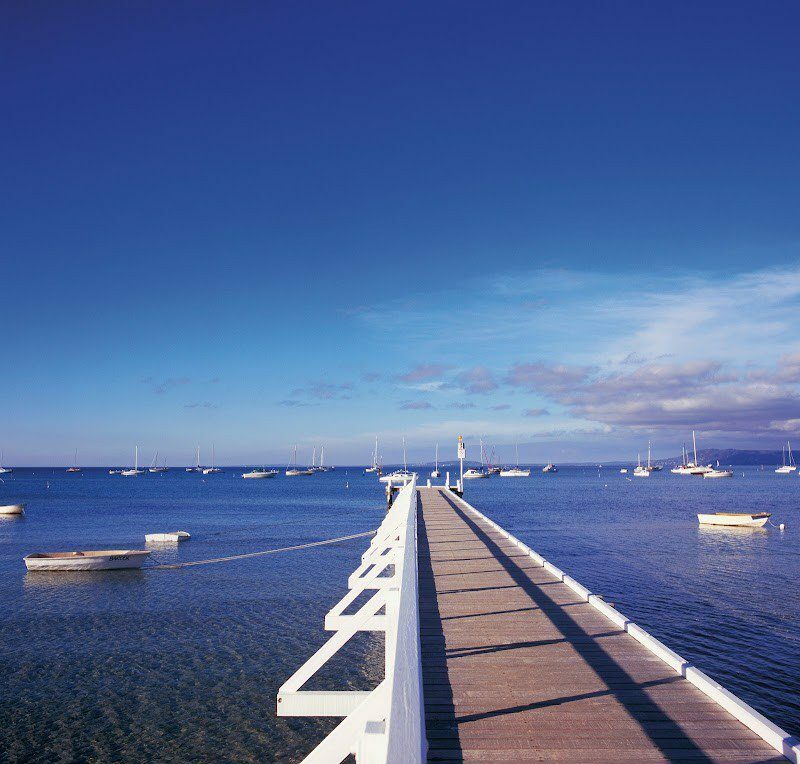 Apollo Bay is a wonderful holiday destination, nestled in the foothills of Apollo Bay. The beach is pristine and a perfect place to relax and enjoy local food and wine, mingling with the locals. If you want to base yourself in Apollo Bay each day, Walk 91 can transfer you out to the walk from the Apollo Bay Information Centre and return you each afternoon, after a great days walking. This option is perfect for those on a tight budget or those walking alone. 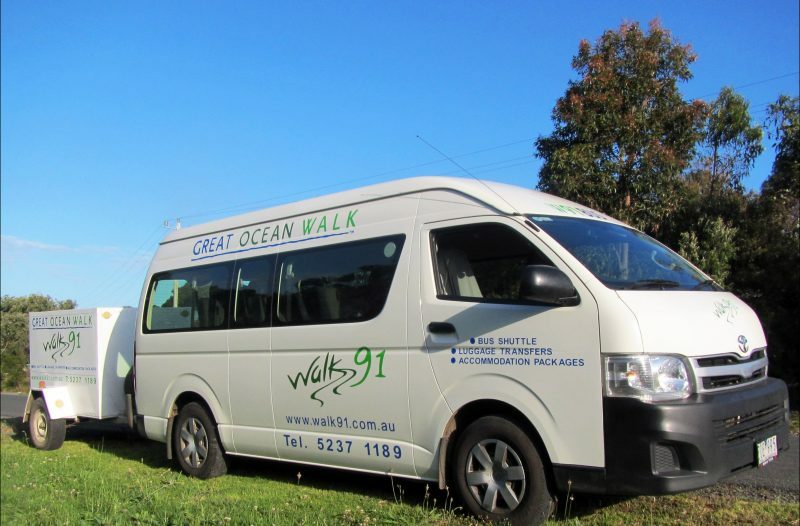 If you are traveling with a group or family, and not everyone is a keen walker, they can relax in town whilst you explore the Great Ocean Walk and enjoy the solitude. Walk 91’s experienced drivers cannot wait to help you explore their backyard where they live, work and play. They look forward to listening to the highlights of your day. Choose from one day walks to three, four, six or seven day walks. Walk 91 provide you with walking notes. The track is well marked, so no technical expertise is required. Just relax and enjoy this magical walk. Walk 91 was founded by a former Parks Victoria Ranger over 10 years ago. 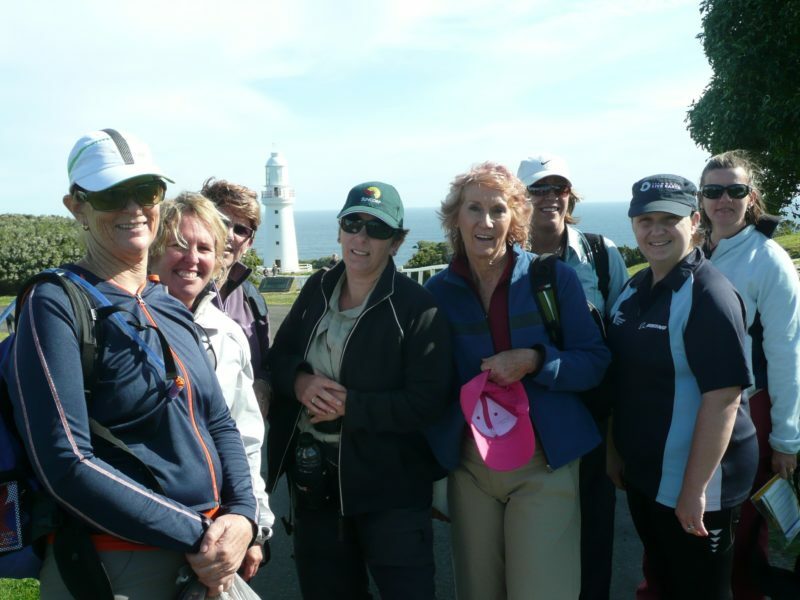 Mark Kininmonth worked on the trail in its initial construction and since then has offered services on the Great Ocean Walk to thousands of passionate walkers. Although Walk 91 offers several ways to complete the walk, you may just want a simple shuttle. Just email Walk 91 with the date you wish to walk and where you would like to be shuttled to and from and they will get back to you with a quote. 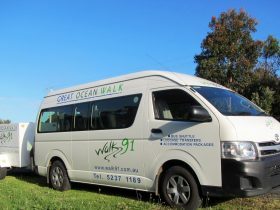 If you would like to explore the walk using your own car, Walk 91 offer a half shuttle service. Meet Walk 91’s experienced friendly drivers each day at your car and they will drop you back to your walks starting point. Walk 91’s team of drivers love the region and want to share it with you. They will give you information pertaining to each days walk and the current conditions and walk options. If there is anything else you would like to know to make your walk that little bit more enjoyable, please feel free to ask. This is a self guided walk, utilising your own car. Walk91 will meet you at your car and drop you back to the day’s starting point. You walk back to your car. In the afternoons you can drive to the accommodation of your own choice, at your own cost.